I hate beating a dead horse to death, but there are a couple of incidences that prompted me to write this article. Navision 1.0 has been out since 1996, yet it always astounds me when I walk into a company claiming that their inventory costing and cost of goods sold is incorrect because Navision is bugged.The first question I always ask is: Have you guys ran the Adjust Cost – Item Entries process? Most of the time, I get the blank stare asking what the hell I’m talking about. The Adjust Cost – Item Entries batch job adjusts inventory values in value entries so that you use the correct adjusted cost for updating the general ledger and so that sales and profit statistics are up to date. The cost adjustment forwards any cost changes from inbound entries, such as those for purchases or production output, to the related outbound entries, such as sales or transfers. Basically, it will update your COGS and the Unit Cost on the item card to the correct cost that the item was brought in. Simply put, you HAVE to run this process BEFORE you do any meaningful financial and costing analysis. It doesn’t matter what your costing method is. Doesn’t matter what your setup is. You HAVE to run this if you want to do inventory costing analysis in Dynamics NAV (Navision). Note that the Adjust Cost – Item Entries will look different depending on the what version of Navision you use. If you do not run this, no analyst in the world can begin to figure out what exactly the cost should be and address any incorrect inventory values you may have. 1. Your COGS on the G/L will go wild. The reason for this is that most companies, when they do not run the adjust cost, will use the general journal to “calculate” what the COGS should be. So when you do decide to let NAV do what it’s suppose to do, you will need to reverse these journal entries. 2. Your Inventory on the G/L will go wild. The reason is the same as above. The journal entries will need to be reversed. 3. Your item unit cost will go wild. The reason, again, is the same as above. A lot of times when you make an inventory journal adjustment to “take out” the inventory with the incorrect cost and positive adjust in the item with the correct cost, you are only doing it on the surface. The way NAV allocates and applies the inventory entries will most likely be different than what you adjusted. Why Bother Going Though the Trouble? Looking at the side affects, you may be wondering, why do I want to bother going through this process if I’m running fine as it is? The answer is simple, but it will reduce time and free up your company’s human resources to focus on important things. Think about the manual spreadsheets and human memories that your salespeople need to figure out what cost the item should be before you can quote a competitive price to your customers. Think about the time it takes your internal accounting staff to figure out what your bottom line should look like on the financial statement. Think about if those times are freed, what other amazing things your employees can come up with to make your business even better. A lot of companies will give their Trial balance to their CPA and let them make do the calculation. But realize that what they’re doing is just an estimate. It is NOT accurate. The CPA’s priority is to make the number seem reasonable so he/she can do your tax return and having paper trail if there’s an audit. His/her goal is not to get the accurate inventory cost. Ask any good accountant, reconcilation is one of the most time consuming and useless tasks. Ask any good business owner, not having accurate profit and loss for each transaction… Well, you get the idea. Let Dynamics NAV do its thing so it can help your business can do its thing. you are so right. But most companies just don’t know. From my days as a Consultant I know that this topic isn’t covered thoroughly enough in most implementation projects. This was also the case at the Company I started working last April as an Administrator. The Adjust Cost Item Entries job hadn’t been properly since 2008 in one of our db’s. I had to let it run at night for 2 weeks in a row to let it finish. 3. Tell someone from the Finance Department to run it periodically. Just to raise awareness and make sure they understand the processes in Navision. Good points! For point #3, it’s not uncommon that the finance department will forget to run this overtime. It will do wonders if the consultants can send gental reminders periodically to run this process. Being kind of a shepherd of Enduser forum @ DUG, I post there about these issues with stable “recurring frequency” of a month and & a half for at least the last 5 years. Yes, the standard practice for any legitimate NAV consultant is to block the posting of inventory accounts. However, when the client can’t figure out why their inventory cost is wrong and their NAV partner fails to emphasize the importance of the Adjust Cost process, they usually make the journal entries with the suggestion from their accountant or CPA. Good for smaller companies, not so good for those with a heavy volume of transactions (Ditto for automatically updating analysis views). We quite frequently automate adjust costs overnight via job queue for our clients, but there is the small matter of ensuring that finance know when to close a period off properly, and notifying them via email when it inevitably fails. Nope. Even if set set the Automatic Cost Adjustment to Always, you still have to run the Adjust Cost – Item Entries process. The documentation on the help and what it does is very misleading. This is why I said in the blog: “it doesn’t matter what your setting is”. This is why we always set the Automatic Cost Adjustment process to Never for all of our clients. Just out of curiosity, can’t this be automated so that it can be run even when forgotten. Yes, it can be. However, you will need to get your partner involved. I’m not sure why Microsoft won’t have the option to allow the process to be automated out of the box without having a developer involved. Thanks Alex – Nice post. Your comments are appreciated. I find your article when I am looking for a wrong cost problem. I get the opinion that you think navision costing is perfect. The fact is navision costing is not perfect and full of bugs. For example right now I have a cost amount with zero quantity in transit location. Navision calculated wrong cost and does not allow me to correct because “entries applied to an outbound transfer cannot be unapplied”. It has only one job in the world and it fails. And yes I run Adjust cost report. I’ve done enough implementations to doubt the Dynamics NAV costing. Most of the time, the problem is from the data that’s fed into Dynamics NAV (the user) or bad Dynamics NAV partners that goes in modify the ledger entries using the developer license. Regarding your specific problem, haven you gotten your Dynamics NAV partner to take a look? There are many causes on why you would have 0 quantity with cost. I found this very interesting, and appreciate this is a lot later, but I would welcome your comments about Standard Cost. Navision Inventory in a Standard Cost system does not seem to work. Irrespective of Value Entries, the item transaction table should always and only have the standard cost. Adjust Cost Entries should be redundant in a standard cost system. Whether we have been modded out of this, I dont know. I agree with you. However, even when you’re using Standard Cost, you will still need to run the Adjust Cost – Item Entries process. No exceptions. For standard cost this report yields nonsensical values. Actual cost are irrelevant to standard costs and revaluation entries. You are giving bad advice. I will never run this again. Just because you do not agree with what NAV gives you does not make it bad advice. If by running this process and NAV is giving you nonsensical values, then I think you have a bigger problem at hand; even if you run standard cost. Ultimately, your Dynamics NAV is your system, you can do whatever you think is right for your company. Alex – thank you for emphasizing this. As a NAV developer and consultant since the NAV under DOS and O/S 2 days (1993) I agree completely. Even when using Standard Cost it is necessary to run the ACIE process. If you are getting nonsensical results on an Inventory Valuation or other report after running this process then it is necessary to dig deeper to see the root issue. The costing in NAV works beautifully but it does require the user to have some understanding of Item Ledger Entries, Value Ledger Entries, and how these are related to provide valuations and COGS computations. Without some basic knowledge in these the system can appear buggy or unpredictable. With knowledge any values can be explained straightforwardly. Just a short story of my experience: I picked up a high value in our GRN Inventory control and went digging. An item was erroneously receipted at a value of R6.3 mil (quantity: 24000) and the actual cost was only R6k. Please bear in mind that this happened in November 2015. The effect of this mess was that inventory is heavily overstated with R6.3 mil and the GRN Inventory account has a credit balance of R6.3mil (liability in the balance sheet). To remedy this, I wrote off the stock (24 000 at a value of R6.3 mil). Increase Cost of goods sold and decrease inventory. To remedy the GRN account, Debit GRN Inventory and credit cost of goods sold. This appears to have solved the problem but I was wrong. I ran the ‘ADJUST COST ITEM ENTRY’ and cost of goods sold and inventory went wild. There are cost entries that now appear and I do not have a clue on how to explain them. As I mentioned before, NAV inventory costing is always correct and accurate. It’s the man-made entries that are wrong. Try reversing all of the man-made entries to the inventory and COGS and see if it’s closer to what you’re looking for. In addition, make sure your Inventory Posting Setup and the General Posting Setup are going to the right accounts. This looks like a problem where you need to get your Dynamics NAV partner (or a NAV professional) involved to dive into this problem. Whenever an item has multiple purchase the average cost is wrong and the unit cost is not the same as per the last purchase or as per the FIFO method average of the last purchase! The reason many have zero qty with cost ia that a purchase receipt was done witb cost. probably with the intension of posting the cost later. The purchase order was later deleted probably with help of a developer without the completion of the process. The moment the item read zero gty on the database. the expected cost that was suppose to be posted drop down the line as the cost. I have seen a situation like these before when I have to investigate the cost where it was coming only to find the exact cost hanging on the expected cost field on the value entry table on futher investigation I was able to find the purchase receipt and the purchase invoice where not all the item where invoice(I do not mean partial invoice, I mean some of the item where not invoice at all but have a cost hanging on it).The item is not a frequency use item or rather it is replenish before it finishes so it was not notice for close to 10 years. they are up to 10 or more items with these problem and they all have their expected cost hanging on the expected cost field and all with zero qty but with the same cost as the expected cost. Even when I use item adjustment by posting positive adjustment without value and then posting negative adjustment with value, and ran the adjustcost item entries the item still come out with zero qty and value of the exact value on the expected cost field. I have to do some calculation with the account on the expected cost before all was normal again these treatment was done all the item before the value was able to read zero. please I advice you do these on the test database before going on the production environment. I would check to see if someone had revalued or backdated some transactions. The inventory adjust cost process will recalculate based on the posting date of the item transactions. When you ran adjust cost. For the first time. …will navision post the cost for all the items regardless of the time they were purchased. Yes, that’s correct. Depending on the version you’re using, you can change the date the adjusting entries post into on the Allow Posting From field on the General Ledger Setup. “Nope. 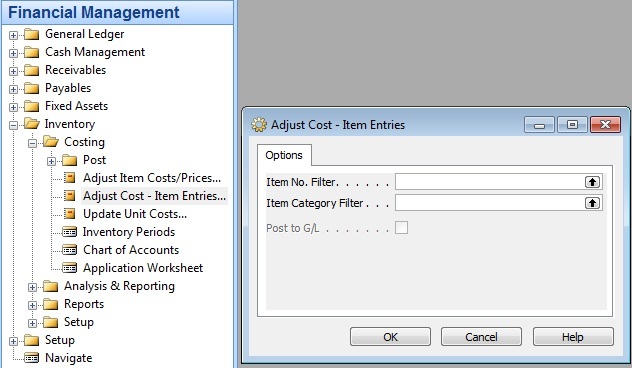 Even if set set the Automatic Cost Adjustment to Always, you still have to run the Adjust Cost – Item Entries process. The documentation on the help and what it does is very misleading. Hi Alex, can teach me why ACIE still need to run even with “Automatic Cost Posting is checked and Automatic Cost Adjustment is set to Always”? Many Thanks. The problem usually ties with assembly or kitted items. Not sure if Microsoft has fixed this in the future releases. I am facing similar type of problem. We ran adjust cost batch job after 6 months. Now system is taking wrong COGS for that particular item. What is the solution? how can i correct this? Someone will need to trace in the item ledger and value entry to see why the costing is off. Standard NAV, assuming there’s no mods done in the costing, will always have a logical chronical order on the costing entries that it makes. The inventory valuation reports starting date value and quantity excludes the item transfered from that location if I give it location filter. It calculates in calculatecostoftransfer() function which doesn’t make a sense since it does not include this function in the ending balance. Why is it neccessary to substract entries with document type transfer from net quantity on that location? The function back dates any transfers that’s made if you set a As of Date on the options tab. Those functions basically “reverses time” and back tracks the ins and the outs of inventory for a specific location. Check whether there are positive increases with $5. It also matters what costing method you’re using.